DSMBs are nothing new. They come in different colours, lengths, materials, and can have many additional features. However, what should you keep in mind when choosing one? Yellow, Orange, Green, Pink, bi-coloured… What is the right one? In a world filled with colourful diving gear, one could also think that the colour of a DSMB should be matched with the colour of your fins! Yet how does the choice of colour really work and what do different colours mean, if in fact there is any meaning? Let’s start by looking at why we use a DSMB. The answer is actually very simple: it needs to attract attention and ensure that you are visible. In the maritime industry, several regulatory requirements exist for life-saving equipment. In fact, the SOLAS (Saving Of Life At Sea) convention and the LSA (Life-Saving Appliance) code require that all the parts of life-saving appliances be made using a highly visible colour so as to assist in detection. Although DSMBs are not seen as maritime life-saving appliances, they do have a similar function, making sure that you don’t get lost through attracting attention. However, no regulatory requirements exist. There is no obligatory colour although it is generally accepted, by the maritime and rescue organisations, that the colours orange, yellow, and to a lesser degree, red, are the most appropriate choices. The only requirement that exists, in the whole diving community, is that it needs to be made of a highly visible colour. It does not suggest any colour. What is really important, is that the colour needs to be in contrast with the surface of the water (and air). Studies have been done to determine the right colour, however, the results of these studies are not always consistent. The colour of the seas we love to dive in are not all the same and the effectiveness of the DSMB colour can also be influenced by sunlight. For our purposes, fluorescent green (green-yellow) and fluorescent orange appear to be the most visible. How about orange for safety & deco stops, and yellow for emergencies? Just as there is no internationally accepted colour, there is also no internationally accepted meaning for the colours actually used. In some areas or amongst some groups of divers, it is generally agreed that orange should be used in normal situations and yellow in an emergency situation. 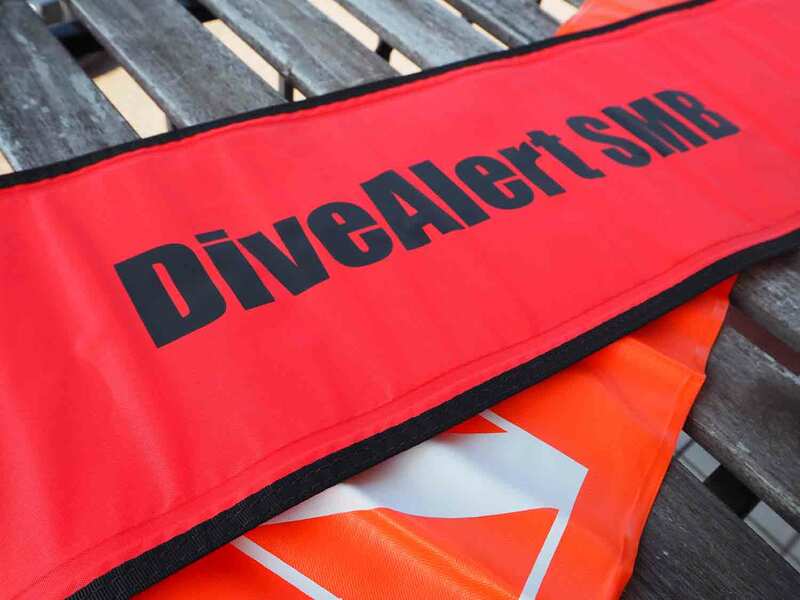 In some cases, divers even attach a slate with a message to the yellow DSMB, making it possible to specify the kind of emergency and assistance needed. 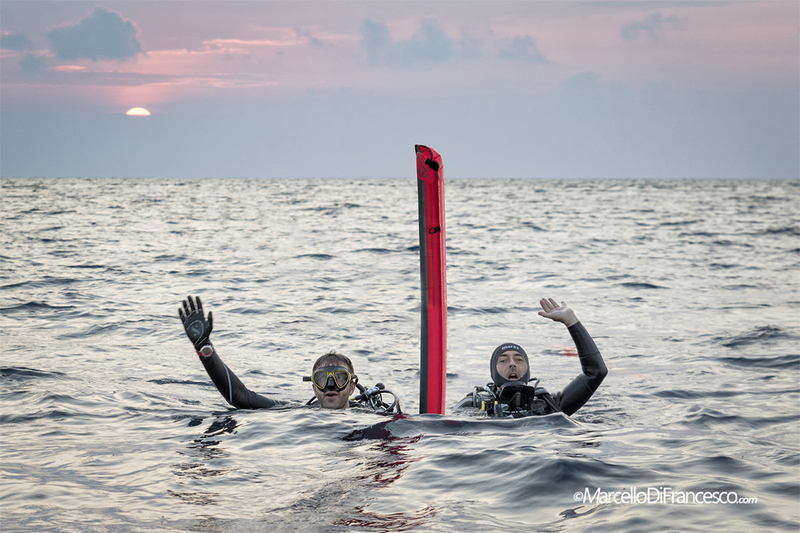 This principle means that these divers then dive with 2 DSMBs and deploy each according to what they want to communicate with those at the surface. This makes it possible for the support crew to react faster and in some cases, to help resolve the emergency situation. 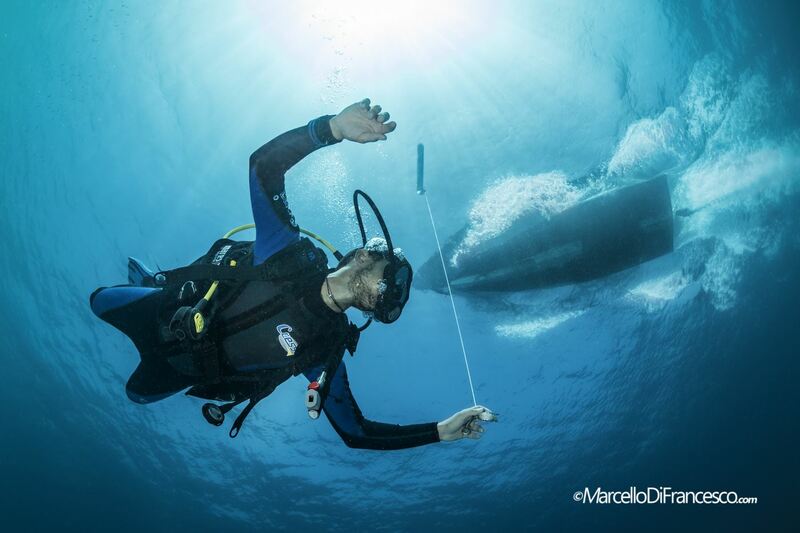 However, this principle only works if all divers in the group have 2 DSMBs. In reality, though, most divers carry only one and even then, in any available colour. Some DSMBs may even have one orange and one yellow side. The reason for this is that the orange side would be more visible in bright sunlight, while the yellow side becomes more visible at dawn. Of course you would not be able to use this kind of DSMB where you are trying to indicate a specific emergency situation. Of importance is that whatever colour is selected, it should help you in being visible and that before the dive, if applicable, one agrees on the significance of the colour used during an emergency. What about the length and material used? Remember the DSMB needs to make you visible. If too short, or when the diameter is too small, it will not be visible from a long distance, especially when used in certain conditions, such as high waves. On the other hand, if it is too long, it might be problematic in maintaining it upright; although the higher it sticks out from the surface, the easier it would be to spot it from a distance. The materials used doesn’t really make a difference in terms of visibility, but these may impact on the quality, hence the durability. Plastic or PVC models are sealed over the length of the DSMB, but these materials coated with “thermo” seals make them less strong compared to the nylon types, which are sewn and may even have an internal bladder, just as we have in a BCD. Additionally, the more expensive nylon types often have additional features, making them a more effective choice. Open at the bottom or self-sealing? Some DSMBs remain open at the bottom. You inflate them with your octopus and send them to the surface. Excess air will get out from the bottom side, avoiding rupture due to the increasing volume during ascent. A problem with these types is that when sending them up from depth, they might “fall over” at the surface and the air could escape. As a result, they could sink again or remain only partially inflated at the surface, making them no longer an effective aid. The self-sealing type, on the other hand, avoids air escaping from the bottom. This guarantees that as long as you keep the line and reel - yes, you need one to send the DSMB to the surface - under tension, the DSMB will stand up at the surface. Indeed, it is not enough to have the DSMB reach the surface: if you want to have it standing up while you are underwater, you must ensure that there is enough tension in the line. Self-sealing DSMBs will not rupture during ascent as they also have an overpressure or release valve. Even if not sending it up from depth but deploying it only at the surface, the self-sealing type still makes your life easier, as air will not escape every time the DSMB falls over. Models are also available that can be inflated using your mouth, by using a small cylinder or your inflator hose. All these features can provide additional benefits, but attaching your inflator hose to send it to the surface might get you into an uncontrolled ascent, and this is not something you want to have happen. In any event, as with all safety materials, you should learn how to use them before you experience an emergency situation.